With the help of advance tools and equipment we are developing a wide range of Bimetal Rivets. The Bimetal Contacts are made by using quality metal and thus, highly resistant to corrosion and abrasion. Moreover, one can get these products at market leading prices. Leveraging on the skills of our talented team and skilled professionals, we are involved in manufacturing and supplying a wide range of Metal Rivets, Tubular Rivets, Bimetal Rivets, Electrical Contacts and Rivet Contacts. 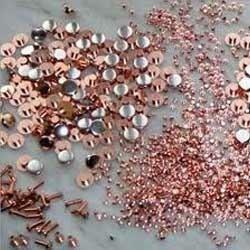 These products are manufactured as per the demands and requirements of the clients. We manufactured these products by using high grade material and ensure their quality abreast with the latest technology. Motief Components is known as the leading industry in the market which established in the year 1992 as a partnership based company. To attain a commendable position in the market, our team work hard day and night. They provide the most suitable products to customers at affordable prices. Our products are extensively demanded due to their unmatchable quality and longer life. In the market, our products are known and appreciated for their hassle free performance in various suitable applications. Customers recommended purchasing our products due to their corrosion resistant nature.